House musician Jonathan Coulton leads a parody game on Ask Me Another at the Pageant in St. Louis, Missouri. In this music parody, lyrics to Ozzy Osbourne's "Crazy Train" are changed to be about Missouri-native Mark Twain. Heard on Matt And Kim: How To Go Outside And Not Die. 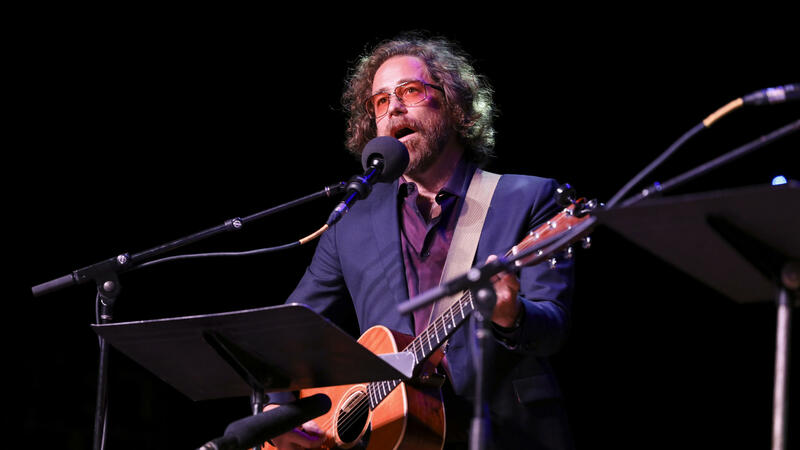 JONATHAN COULTON: From The Pageant in St. Louis, this is NPR's ASK ME ANOTHER. I'm Jonathan Coulton. Now here's your host, Ophira Eisenberg. Thank you, Jonathan. Before the break, we met our contestants, Sheila and Amanda. Up next, we've got a literary game that is off the rails called Crazy Twain. EISENBERG: It's a game designed to upset authors and rock stars everywhere by combining heavy metal and heavy-hitting literature. EISENBERG: But first, let's check in with our contestants. Sheila, you once entered the National Chicken Cooking Contest. EISENBERG: With a made-up recipe. OLIVERI: I got a phone call one day during those dark stay-at-home-mom years. And the person on the other line of the phone said, congratulations, you've been chosen to represent the state of Missouri in the National Chicken Cooking Contest. And I replied, did no one else enter? OLIVERI: And she was a little upset about that. EISENBERG: What was your made-up recipe? What'd it involve? OLIVERI: Basically, it was everything that will stop your heart all in one dish. EISENBERG: (Laughter) And how did the judges like it? OLIVERI: Well, I didn't win, but I do have a silver-plate bowl with my name and Missouri engraved in the side and this lovely, hideous-shade-of-green sash that proclaims me the Missouri Chicken Cooking Contest representative. EISENBERG: I mean, I have never been. Give me something that stood out to you. PRICE: I got delayed for about two and a half weeks. And when you're there for 30 days to try and get stuff done - is a long time. PRICE: And so we'd been delayed two and a half weeks. We just get delayed and delayed and delayed. And finally we get this call, and they say, we have a plane, but you have to leave right now. And we're just, like, trying to hurry and everything. And we're so excited to go out in the field. And our shuttle driver goes, you're delayed. We're going to have to hang out at the airfield. We have a medevac coming from South Pole. And our whole field season's kind of gone to not. But it's kind of OK because we saved Buzz Aldrin's life. PRICE: (Laughter) So I just want to say, Buzz Aldrin, if you're listening, I love you. Thank you for getting me into science, but you owe me a plane. EISENBERG: Your next game is a music parody game about Mark Twain, and the points are doubled. Sheila, you're in the lead. Stay in the lead, and you are in the final round. Amanda, you need to get more points, or we will feed you to a Clydesdale. We weren't joking about that. COULTON: We are in St. Louis. Mark Twain's childhood home is just north of here. So we changed the lyrics of the Ozzy Osbourne song "Crazy Train..."
COULTON: ...(Laughter) To be about things associated with Mark Twain, and we call this game Crazy Twain. COULTON: And I must tell you honestly that the title of the game is the primary reason that the game exists. COULTON: So just ring in to tell me what I'm singing about. Here we go. (Singing) Crazy to use my real name. Something more catchy increases my fame. They chose this the day I was born, my real first and last name, which sandwiched Langhorne. COULTON: Samuel Clemens is correct. COULTON: (Singing) On the Mississippi, learning fore from aft, I learned how to pilot this watercraft, a giant paddle, wheel spinning round a shaft. COULTON: A riverboat is the answer. COULTON: This song is very high, everybody. COULTON: I'm getting hazard pay for it though, so don't worry. COULTON: Yeah. I get paid extra when it's too high. COULTON: (Singing) You cannot picture me without this thing, big, white and bushy, on my lip - upper lip. COULTON: A mustache. That's right. COULTON: (Singing) When I was born, a thing in the sky. I said when it came back is when I would die. It ended the way it began. This small cosmic snowball bookended my span. EISENBERG: The Halley's Comet comes around the Earth every 75 years, including the year Mark Twain was born, 1835. Mark Twain predicted that he would die when it came back. He did. COULTON: Maybe he's an alien who came from the planet Halley's Comet. They dropped him off and then picked him up. EISENBERG: (Laughter) He's like, my ride's coming back round. EISENBERG: He's like, until then, I'm going to be the most quotable person of all time. COULTON: I'm probably going to grow one of those moustaches now that I think about it. EISENBERG: I'm going to grow a mustache. COULTON: This is your last clue. (Singing) It's nasty habit. But nicotine me please. These brown tobacco rolls put my mind at ease. I smoked so much my mustache smelled like these. COULTON: Yeah, cigar is the answer. That's correct. PRICE: You didn't say the size. COULTON: That's true. I didn't say the size. You're absolutely right. Ophira, how did our contestants do in this game? EISENBERG: After two games, Sheila, congratulations. You are moving on to our final round.